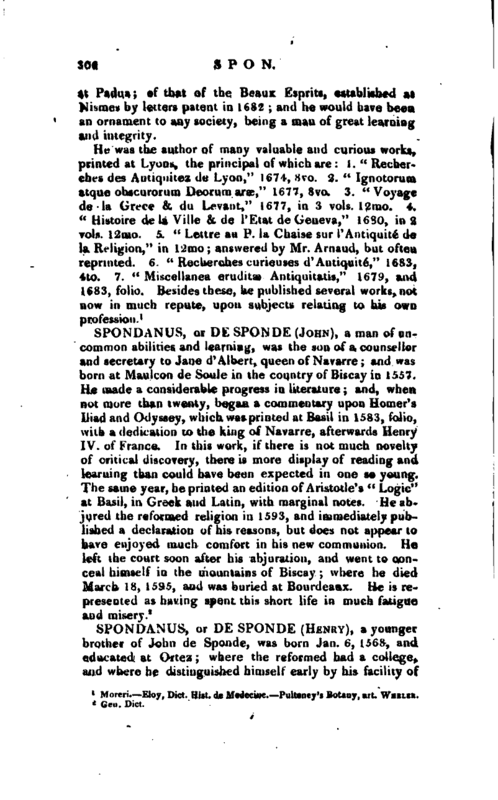 , son of the preceding, was born at Lyons in 1647. After an education of great care, he was admitted doctor of physic at Montpellier in 1667, and a member of the college of physicians at Lyons in 1669. These two years he spent at Strasburg with Boeder; and there becoming very intimate with Charles Patin, he contracted, probably from that gentleman, a strong passion for antiquities. 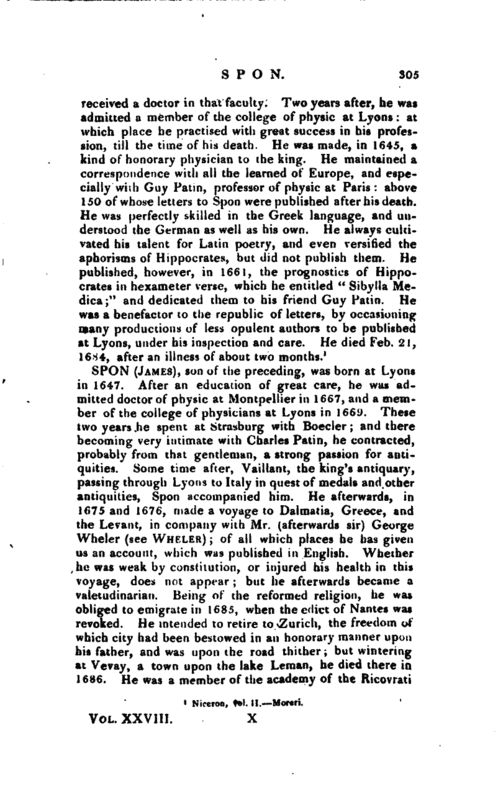 Some time after, Vaillant, the king’s antiquary, passing through Lyons to Italy in quest of medals and other antiquities, Spon accompanied him. He afterwards, in 1675 amj 1676, made a voyage to Dalmatia, Greece, and the Levant, in company with Mr. (afterwards sir) George Wheler (see Wheler); of all which places he has given us an account, which was published in English. Whether he was weak by constitution, or injured his health in this voyage, does not appear; but he afterwards became a valetudinarian. Being of the reformed religion, he was obliged to emigrate in 1685, when the edict of Nantes was revoked. He intended to retire to Zurich, the freedom of which city had been bestowed in an honorary manner upon his father, and was upon the road thither; but wintering at Vevay, a town upon the lake Leman, he died there in 1686. He was a member of the academy of the Ricovrati | at Padua; of that of the Beaux Esprits, esublishevi Nismes by letters patent in 1682 and he would have b; an ornament to any society, being a man of great learnir, and integrity. Moreri. —Eloy, —Dict. Hist. de Medeciue. —Pulteney’s Botany, art. Wheler.